Rob Whitlock is a longtime fixture on San Diego's jazz scene. Whether out front, backing other artists on keyboards or in tandem with his vocalist wife, Amber, Whitlock's is a familiar name to area music fans. 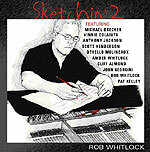 A new CD finds Whitlock surrounded by top-rank talent, and turning in a performance reflective of the stellar backing support. With jazz superstar saxophonist Michael Brecker lending his talents to several cuts, and L.A. guitarist Scott Henderson adding some rock-tinged punch to others, "Sketchin' 2" ranges from mellow straight-ahead jazz to almost a hard funk on an edgy cover of Eddie Harris' classic "Cold Duck Time." Wife Amber takes the only vocal on "Them There Eyes," with a lithe, light approach that floats about the band. Throughout, Rob Whitlock's keyboards complement his guests, occasionally pushing them a touch. Whether on piano or Hammond B-3 organ, Whitlock displays taste, grace and passion in his playing. Rob Whitlock performs Saturday at Dizzy's in San Diego.